I was planning to scratch build the Maschinen Krieger Sdh. 232 in 1/72 scale, but had reservations about sacrificing my Roden Sd.Kfz. 231. I remembered that I had several Sd.Kfz. 234 kits in 1/76 scale (Airfix & Matchbox), so I decided to make a Sdh. 234 variant. I'm not sure if the Sd.Kfz. 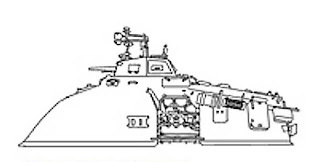 234 hull is canon, but a troop carrier based on this hull has been built by Run Chicken S (presumably with input from Kow Yokoyama if I read the copyright information on the bottom of the page correctly). 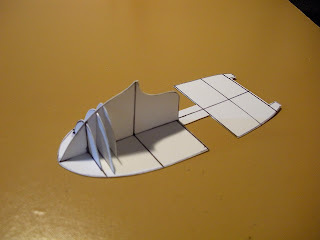 The first thing I did was to try and determine the exact dimensions of the Sdh. 232. Using the image above as a template, I reproduced it so that the Sd.Kfz. 231 portion was 1/72 scale. I can't remember the website where I got the image from (is it from the 1/76 Zionel Westen Sandstalker box art? ), but it looks comparable to the actual models shown in the Ma.K Encyclopedia. However, when compared, the dimensions given in the Ma.K Encyclopedia don't really correlate with the dimensions of the real world Sd.Kfz. 231. If I combine this image with 1/72 Sd.Kfz. 231 dimensions, the model I plan would be closer to 1/64 in Ma.K universe terms. That's okay though. I'm still going to call it 1/72 for my own purposes. 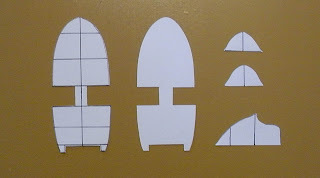 Using some Evergreen plastic card, I cut out some patterns to get started. Somehow I messed up my measurements so the ribs were too tall. I had to move them backwards, which affected the distance to the edge of the base.